For years scientists turned to the CRC Handbook of Laser Science & Technology for reliable data on optical materials. Out of print for several years, that standard-setting work now has a successor: the Handbook of Optical Materials. This new handbook is an authoritative compilation of the physical properties of materials used in all types of lasers and optical systems. 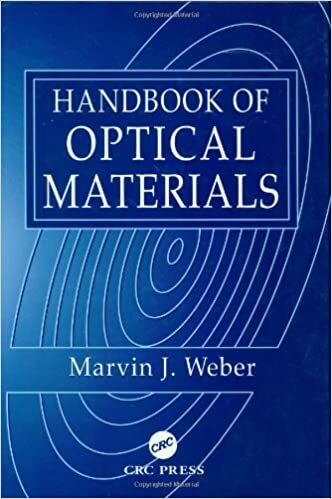 In it, scientist, author, and editor Dr. Marvin J. Weber provides extensive data tabulations and references for the most important optical materials, including crystals, glasses, polymers, metals, liquids, and gases. The properties detailed include both linear and nonlinear optical properties, mechanical properties, thermal properties together with many additional special properties, such as electro-, magneto-, and elasto-optic properties. Using a minimum of narration and logically organized by material properties, the handbook's unique presentation simplifies the process of comparing different materials for their suitability in particular applications. Appendices furnish a wealth of other useful information, including lists of the many abbreviations and acronyms that proliferate in this field. The Handbook of Optical Materials is simply the most complete one-stop source available for materials data essential to lasers and optical systems.